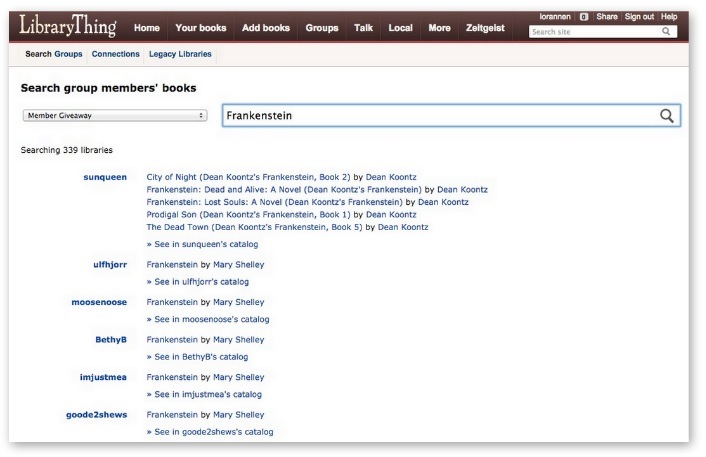 We’ve now added a handy, “Advanced Search” feature, more like that offered by many traditional library catalogs. When you search it converts your advanced search options into the text syntax, so it’s also a way of showing how that works. Let us know what you think on Talk. Group members’ libraries (currently restricted to groups with fewer than 1,000 members). This option is available on group pages (eg., Le Salon Litteraire du Peuple pour le Peuple). 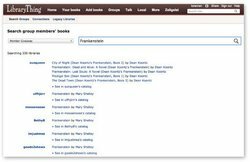 Libraries of your groups, available from site search. Libraries of your connections (friends, interesting libraries, etc. ), available from site search. Legacy Libraries, from site search. This opens up all sorts of possibilities: you and your family members or friends can create a group together and easily search across the all the books in your libraries, or start a neighborhood group*. You can look for interesting books within a given group. For example, Tim enjoys searching for “Alexander the Great” in the Alexander the Great group. Be creative, and if you do something really nifty with this feature, make sure and tell us about it! Come discuss it on Talk. Many thanks to members of the Board for Extreme Thing Advances for help developing this feature. * I’m already seeing Tim combining this new feature with the “what should you borrow?” recommendations so that he can plunder my bookshelves! Casey and I have completed work on a cross-LibraryThing search system. Search is now available from every page. It searches one type (like works or authors) at a time, but always gives you result-counts for all types on the left. Click on the type to pivot off it instead. It includes a number of elements not formerly searchable (or searchable well), like member reviews and words in tags. Tabs have been reorganized a bit. The search tab has been removed and the “More” tab moved left. The “Zeitgeist” tab has been removed. It will probably be available under “more,” from the home page and at the bottom of every page (like “about,” which was a tab once). Find out more, and talk about it on Talk. 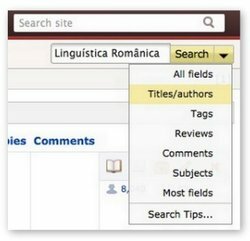 I’ve changed how the “all fields” search for your library works. It’s new and still being worked on—you can discuss problems and requests here on Talk. But it’s faster, solves most character set issues and allows “fielded” queries. Update: It supports “all,” “tag,” “title,” “author,” “ISBN,” “subject,” “dewey,” “LCCN,” “source,” “date,” “review” and “comment.” (You can use plural for all names too.) By default, it now uses the field “most,” which is “all” minus subjects, reviews and comments.